How to best photograph chips and get the best results possible. 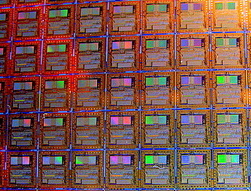 To be of good quality and resolution, computer chips with Integrated Circuits need to be photographed with some type of magnifying device such as a microscope. There is any number of different microscopes and magnifying systems to do this. In the industry, microscopes are used for quality control and debugging problems with the chips. 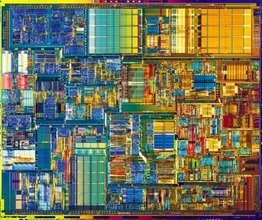 Computer chips contain incredible numbers of circuits and transistors in a chip the size of a fingernail and as a result have to have the most stringent of manufacturing processes. That means utter cleanliness in clean rooms. Photographs will likewise require preciseness and care. One way to do this with packaged computer chips is hazardous and should not be done if you don't know what you are doing. The chips are put into a pot with concentrated sulfuric acid that is then boiled and the plastic is destroyed, leaving the silicon chip and metal circuitry exposed. You can then use your magnifying equipment to photograph the circuitry inside. Any left over carbon can be cleaned with Nitric acid. Remember that this acid is an active oxidizer so you must not have any cigarette or open flame near it. These acids are strongly corrosive so personal protective equipment must be worn. Many of the patterns are beautiful and you can spend many hours studying the patterns. This could be very helpful for computer and electronic students and engineers who are studying how to design and manufacture these chips. Only do this with chips that are no good or obsolete of course, not anything important, rare or valuable. If you are photographing chips that don't need to be cracked open like mentioned above, then break out your microscope. A good USB Digital microscope will be able to take JPEG and Bitmap images at least. You will want one that goes up to 200x at a minimum because these circuits are tiny. Some photography may require up to 2000x to show the details of the chip, depending on the age. Micro circuitry has gotten smaller and smaller. Then, to make the circuitry "pop" for a more richly detailed photo, the chip is lit with a tungsten-halogen light. Details can be better seen at magnifications up to 600x to 2000x. Nikon, a maker of high quality optical microscopes, offers an educational website covering Microscopic Lighting & Photography techniques for hobbyists. When analyzing computer chips, photographing them is a necessary part of the process. Today a modern chip the size of a dime can do more work than did an entire building of computer equipment did in the early days. The newer the chip, the smaller the circuits will usually be. This is for the real micro circuitry. Silicon wafers by contrast are very colorful and can be really fun and enjoyable to photograph, with every color in the rainbow. This could be a hobby for someone who has a an artistic flare. The smallest of chip circuits may require a scanning electron microscope (SEM), which is normally not available for home use. You may be able to get permission to use one at a local university or if you don't mind paying money perhaps you could go to a private lab. The circuits are below the level of an optical microscope frequently and so will require a SEM to photograph them. Generally this will not be hobby material, using an SEM to look at these but a professional's tool. So what has a chip in it that can be photographed and examined? The answer is, nearly anything does these days. Any modern device has them, smart cards, credit cards, product packaging and almost everything these days can have some kind of computer chip. This gives you a nearly infinite number of sources of device chips that you can examine with a microscope. Of course, you will need to recognize what the chip looks like and remove it. Perhaps an RFID chip might make a good starter. These can be found in many security devices in stores. Though not really a computer chip in the strictest sense, they could be good until you get the feel. Then you can graduate perhaps to a non-functional radio or an old cell phone. All of these are run by chips and if you know where to look and how to remove them then you will be on your way. Photographing microchips can be done for fun, and purely artistic reasons, or it can done to analyze them for industry or for learning. Whatever your reason, be sure that you do it safely. New chips pack more and more features all the time, making their study challenging. Safety, practice and perseverance will get you everywhere. Silicon wafers are a macro photographers heaven. Every color in the rainbow is present on an illuminated wafer due to the way the light reflects off of the wafers etched surface. With the correct lighting, many of the chips architectural features can be seen.